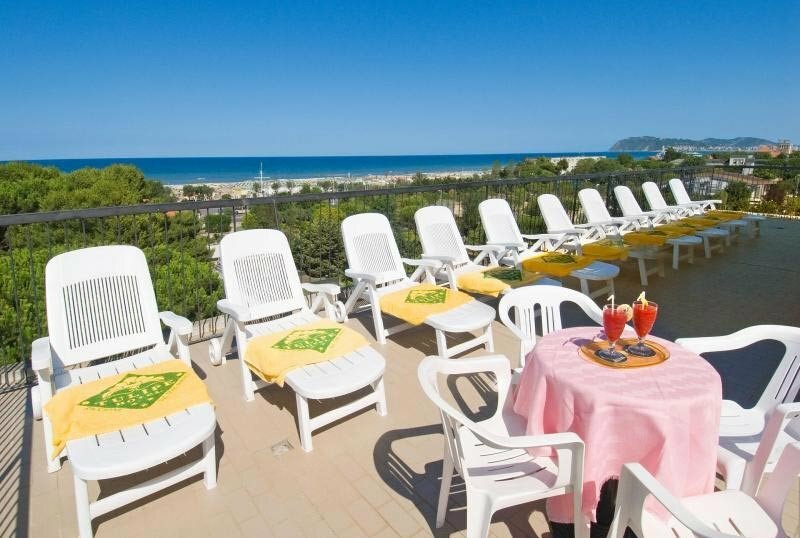 The Hotel Tulipe is located a few steps from the sea and from the Terme di Riccione. The common areas are spacious, guests have at their disposal bicycles, private parking, WI-FI and numerous services for children. It admits pets of all sizes. The hotel is located in Riccione opposite the spa, less than 5 minutes walk from the beach. The rooms are all equipped with balcony, independent air conditioning, satellite TV and digital terrestrial television, recently renovated bathroom with hairdryer and courtesy set, electric lock, WI-FI, direct dial telephone, safe and fridge. Sea view in 10 rooms, on request. Garden, open-air porch, terrace, free bicycles, reading room, two breakfast rooms, lounge bar, TV room, lift, beach towel, welcome drink, theme nights, pay laundry service. The hotel is equipped for cyclists, newspapers on request. PARKING: uncovered and free (for stays of at least 7 days). AGREEMENTS: beach, thermal baths, Perle d'Acqua park, amusement parks. BREAKFAST: international buffet, to be enjoyed in the inner rooms or on the open-air porch, with brioche, homemade cakes, yogurt, fruit juices, cereals, fresh fruit, cold cuts and fresh cheeses. LUNCH AND DINNER: local cuisine with 3-choice menu. Pasta and desserts are homemade. Drinks are included in the all inclusive formula. CHANGES: vegetarian cuisine, gluten free products on request. OTHER: the hotel organizes typical romagnole dinners with local products. In the hotel: outdoor playground area, strollers, entertainment, gadgets for children. For a fee: baby sitter and pediatrician. At meals: baby menu, baby food, high chairs, kitchenette for mothers, bottle warmer, afternoon snack. On the beach: baby / mini / junior club, entertainment. The hotel has an agreement with the beaches n. 46/47 and n. 49/50. Among the services available: children's playground area, baby / mini / junior club, entertainment and a 72 sqm heated pool with children's pool. The prices listed are per person per day for a min. of 3 days. - The meals will not be deducted, alternatively can be replaced with packed lunch. On the occasion of the Easter holidays and the bridges of 25 April and 1 May, come to the Hotel Tulipe Nazionale. Here you are in the spa area, a few meters from the sea and from the shopping streets and nightlife of Riccione ... Ideal to enjoy a relaxing and fun summer preview. MORE A SPECIAL GIFT FOR YOU ... Stay at least 6 nights at the Hotel Tulipe Nazionale and you have 1 entry offered by us to the Riccione Spa for each paying adult! 2 INPUTS AT THE PRICE OF ONE! 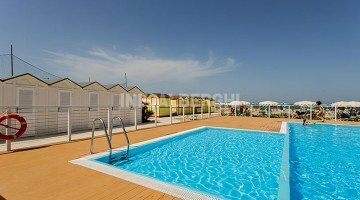 June 2019 in Riccione: from 3 to 16 June starting from just € 55.00 per day per person, in FULL BOARD with Parking included!